I’m often asked how a couple can make their wedding special and incorporate the help and personality of their guests and family. Angelina Jolie and Brad Pitt knocked this concept out of the park. The wedding was very laid back and focused on their family. Angela Jolie’s Versace wedding gown had a traditional fitted bodice and full skirt. What made this look stand out was her children’s art work hand-sewn into the veil. Talk about setting a trend. I can see this veil being passed down to her daughters. I envision many brides embracing this look for 2015. 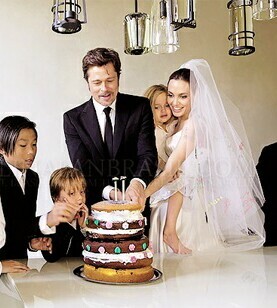 Their wedding cake was designed and made by their children. The “naked wedding cake” will also be a trend for this upcoming year. It’s a cake without icing. Some cultures have their own traditions. 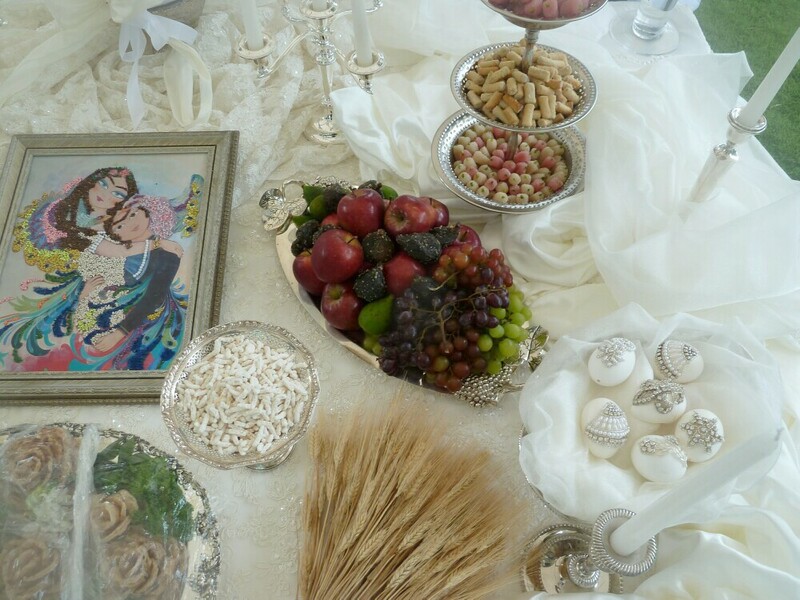 Persian weddings have the friends and family of the bride creating a Sofreye Aghd (wedding spread). This is displayed and is a key part of the ceremony. It includes a large mirror, candelabras, incense, decorated eggs, honey and other items which all have meaning for the wedding. A Sardinian ceremony will involve breaking a plate with grains, salt, rose petals, candy and money. Sardinian tradition says you break the plate and throw its contents onto the bride and groom. By emptying the plate and throwing its contents, you symbolically pass these same qualities (abundance, wisdom, tenderness, sweetness and richness) onto the bride and groom and their life as a married couple. 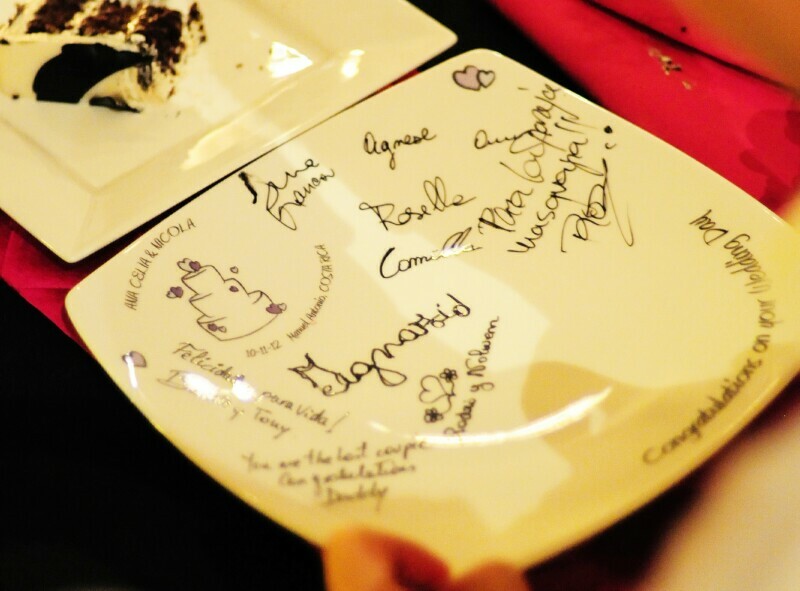 Taking this one step further you could ask your guests to sign a plate to keep as a remembrance of your wedding. The guest book is common at most weddings. Asking your guests to give you some advice for the future gives them a chance to impart their wisdom. Try decorating with photos that you’ve taken with your guests over the years. It’s fun to find the pictures and there are always memories to talk about. There are no rules in creating a wedding that reflects your personality, vision and incorporates the participation of your family and guests. This entry was posted in Unusual Weddings, Wedding Cakes, Wedding Pictures by Randy Gritz. Bookmark the permalink.